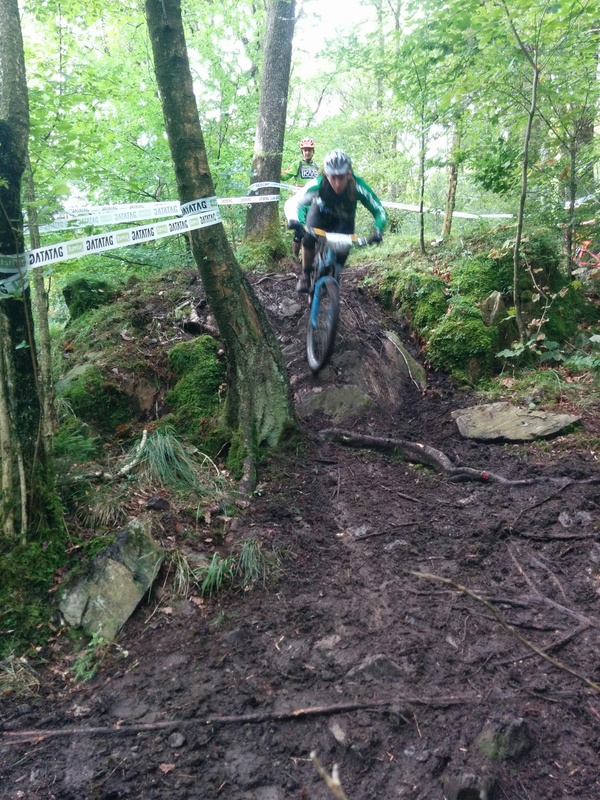 I’ve spent many happy hours enjoying the brilliant technical trails around Grizedale Forest, but until this weekend I’d never had the chance to race there. Friends who’d competed in previous PMBA and UKGE events at the forest had reported back that the organisers tended to favour fresh-cut tracks through the woods over the kind of fast, rocky trails the area is best-known for – and I understand this is because it’s all but impossible to get permission for racing on bridleways. Anyway, while I’d love to race those familiar trails, I wasn’t going to complain about the alternative either. Arriving at 8.40am the parking field was already filling up nicely and I nosed up behind early bird Neal – who was just getting changed into his riding kit. After getting chatting with a lone rider called Mike parked next to us, we all headed out together for practice – expecting it’d take a couple of hours and maybe see us climbing 500m or so. It was closer to four hours and 1,000m of ascent over 26km later that we got back to the car park – having also hooked up with our pal Adam on the last stage. I’m saving the actual stage descriptions for the race run – but for now I’ll just say that we were so impressed with the quality of the trails that we didn’t even consider moaning about all that climbing. Luckily we’d allowed ourselves a generous lunch break, so there was still time to wash the bikes, eat our sarnies and have a chit-chat before heading out again – by which time the sun was shining and it felt like summer (at last). 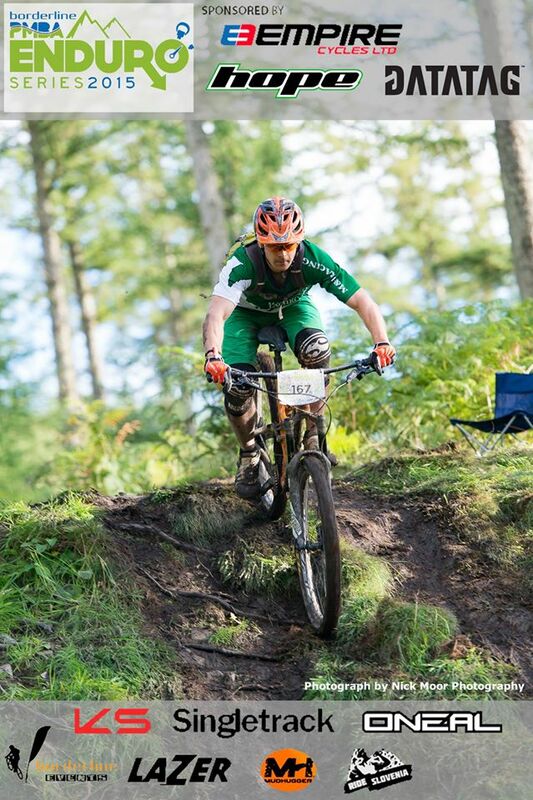 Mike had an earlier race slot and was replaced by Cumbrian racer Lee in our foursome for the race loop. The route to the first stage took us up the “baby heads” (aka “boulder alley”) trail opposite the visitor centre, then on an undulating traverse until we swerved off the fire road into a densely planted patch of pine trees. Despite heavy rain over the last 24 hours the ground in the trees didn’t seem too slippy – being covered with a thick carpet of pine needles. The queue for stage one was a lot shorter than it had been for practice, so it wasn’t long before we were straight into the thick of the twisty, rocky, slightly greasy and necky descent through the trees. The ground had dried up a bit since the morning so I probably could have ridden this stage quicker, but I was happy to feel like I was keeping my flow and staying loose down the steep, muddy chutes as I made it to the bottom in one piece. The transfer to stage two, was a bit of an epic – much like the stage itself. After taking a slow run down it in practice we’d commented that this was likely to be where the race was won or lost. And so it turned out – for me at least. It started with some nice turns before getting muddier and more slippery with bigger roots and a series of steep chutes – also covered in mud. By race time a line had cleared but it was still difficult to keep the bike on line and a couple of times I ended up getting sucked onto a low line and having to climb up around a tree after coming to a virtual halt. My slow progress was confirmed by the marshalls’ whistles getting closer together – and the chasing rider passed me on the fire road climb. Determined to make a bit of ground up, I plunged into the fast, rocky track off the fire road – trying not to swallow too much wheel spray as I attempted to keep the guy in front in sight. However I managed to get a wobble on just before a little log jump and ended up highsiding it over the drop and landing on my side in the mud. No damage done but I had to scrabble back up in the mud to get my bike and probably wasted 30 seconds in total. The climb to stage three had slightly less total ascent than the previous one, but it delivered it all in one go. Fortunately the climb was mostly easy and there were stunning views across the Lake District in one direction and – when we got higher – the Pennines in the other. Pushing up towards stage three. One rider was clearly suffering though, as he recruited his motorbike-riding pal to tow him up the long drag from Lawsons Park. I didn’t know Vincenzo Nibali rode an orange Transition. 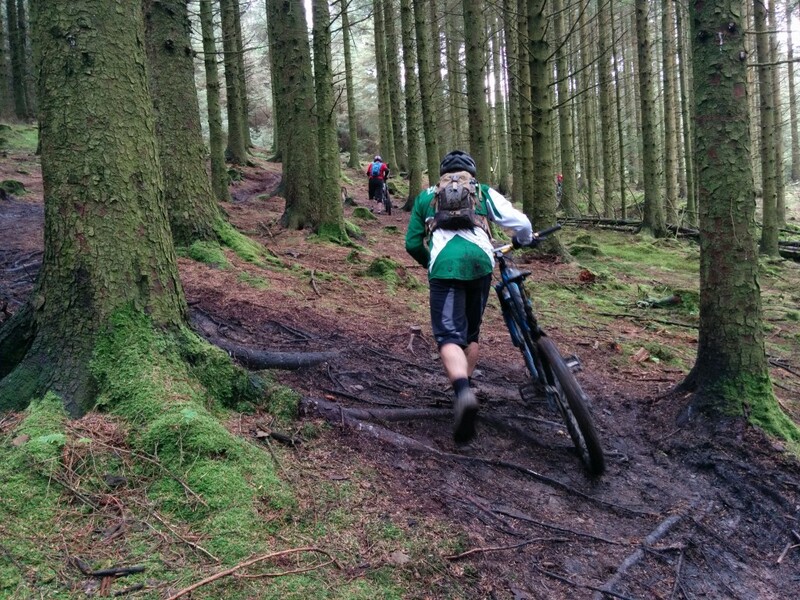 Stage three began at the top of Carron Crag – the highest point in Grizedale Forest – and descended a relatively short distance to the fire road. But despite only taking about a minute and a half, it was an absolute hoot and featured a series of little drops and rocky outcrops on a trail wide enough to allow line choice to play a big part in how quickly, smoothly or safely (delete as applicable) you got down the trail. After getting slightly bogged down in a patch of mud just before a small crest, I span my little legs as fast as they’d go to attack the final, faster and narrower section – which was rough singletrack pocked with rocks and the odd little drop. Everyone was buzzing at the end of this one, unless they were fixing punctures instead. The big climbs were done now and there was a very brief scoot along the fire road to the start of stage four – another short one but this time with more of a trail centre kind of feel – except better than most trail centres. Some beautiful corners, a few rocky chutes, a little bit of mud (surprise, surprise) and the next thing we knew we were on the fire road panting and grinning. The boulder on stage five was probably the best viewing spot on the loop. A bit more fire road cruising – and a short climb later and we were at stage five – which we were happy to have discovered in practice was another natural woodsy trail rather than the jumpy black run. Starting on the fire road there was a brief sprint before swinging right into the woods and some sweeping turns with good grip and just a few not-too-awkward roots. But what’s that sign with three arrows on it hanging up? Oh, it’s a steep, off camber boulder roll into a pile of mud. I’d been worried about this one as although the boulder itself hadn’t caused me any issues in practice, I’d stalled in the thick pile of mud directly after it. In my race run I chose a more direct and awkward line down the boulder, scooting across the hole and root at the bottom with a quick dab or two to stay upright. There was a fair bit less mud than in practice so I didn’t come to a complete halt but I did have to do a bit more undignified scooting to get down the steep, very muddy descent that followed – before getting my feet back up and attacking the last drop and run out. 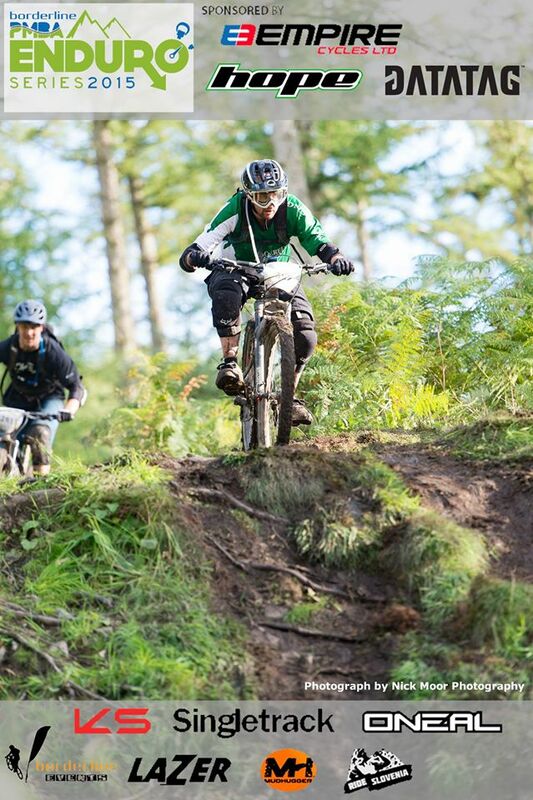 Once out of the trees we were on fast, smooth trails with just a few wiggly corners and rock features to tackle before reaching the end and a sharp corner that threw riders panting and gasping out by the visitor centre. Despite climbing around 2,000m and being out on the bike for the best part of eight hours, the easy pace of the transfers and the manageable gradients around Grizedale meant that we didn’t feel totally destroyed at the end. All that hill climbing on my road bike over winter paid off for me when it came to the climbing – but I reckon my result (mid-table in vets) would have been better if I’d spent more time riding my MTB in the muck. Fortunately Adam and Neal kept the Mackerel flag flying high with top-third places in a packed Masters category – while special guest Lee scored a storming fifth in Vets. Mud was not in short supply on the hand-cut trails. Who needs a national series? 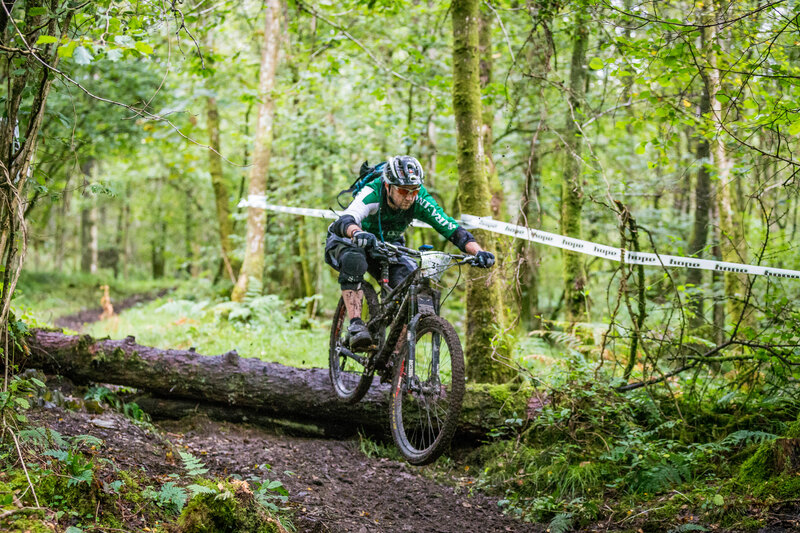 In a week when it had been announced that the UK Gravity Enduro series was being canned, PMBA put on a race that was more technically and physically demanding than any of the UKGE events I’ve raced. They also managed to cultivate a relaxed and fun vibe, with no stress about making stage start times (a good job considering the size of the loop) – and they combined this with slick organisation, good comms and a reliable faff-free timing system. It’s a winning formula and it’s probably a lot harder than they make it look. I gather a few racers struggled with the scale of the day’s riding – some lacking fitness and others traveling fashionably light with just a single water bottle and a spare tube taped to their frame. Hopefully the organisers won’t decide to tone it down next time they put a race on here, because we need more grassroots events like this and not less. 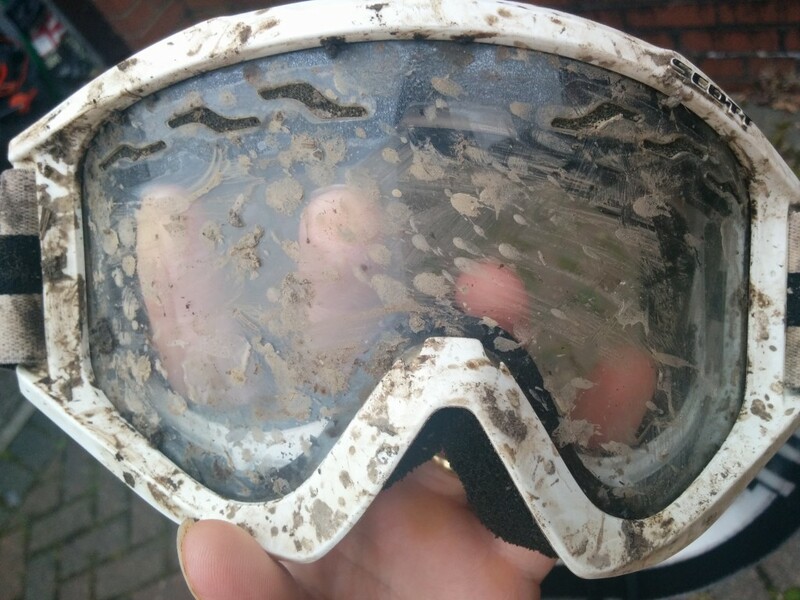 I just need to make sure I fit a better mudguard next time.